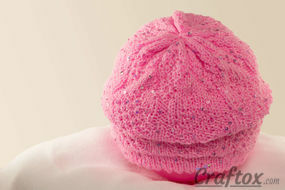 Easy beanie with paillettes for 5-6-year-old girl. Free knitting pattern. 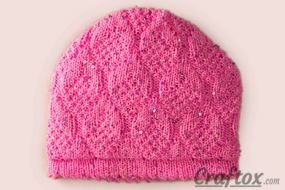 Easy beanie with paillettes for 5-6-year-old girl. Front view. 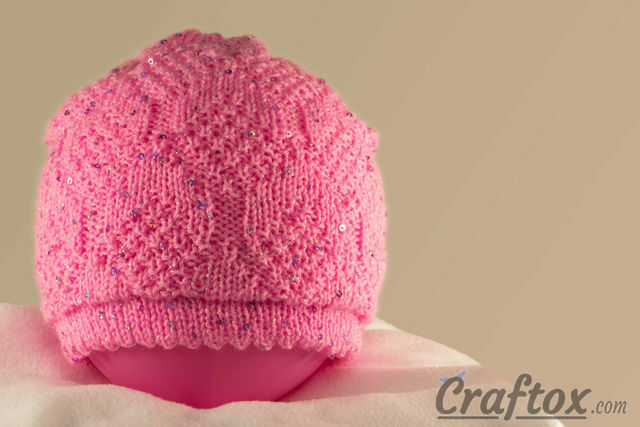 The hat is knitted in the round. For this purpose, I cast on 80 stitches. Then rounds 1-7: knit all the stitches. In order to make some purls in the 8 round, I knitted *Knit two together, yarnover; repeat from * to end of round. Rounds 9-15: knit all the stitches. Now you need to knit a connecting round, so open the stitches of the first round and put them on the additional needles. After this, you need to fold the fabric with inner face inside and Knit two together, one from the main needle and another from the additional one. I added 16 stitches uniformly around the hat’s perimeter = 96 stitches. After knitting according to the pattern chart №1, 2 repeat upwards. I joined the stitches in a circle and tied them up. To make the hat warmer I used lining material. I knitted it with acrylic yarn of the appropriate color. For this purpose, I raised 90 stitches in the connecting round with the help of hook. Next 35 rounds: knit all the stitches. To round the lining material, I divided all stitches into 6 parts (by 15 stitches in each part) and made diminutions (Knit two together) in each second round, 13 times in the beginning of each part. If you have any questions, comments and feedback, please feel free to contact me. Pattern chart 1. Easy beanie with paillettes for 5-6-year-old girl.